We all know that communication is very important in the scope of the Bigger Picture... but these kids, man! Ahem. I had to get that out of my system. Because all the secrets and all the assumptions and all the jumping to conclusions gets tiring sometimes. Which is why, once again, I find myself conflicted about how I felt about a book in this Starbound series--the third and final book, to be exact. Because, for the most part, Their Fractured World, much like the previous two books in this trilogy, was enjoyable and kind of majestic, in a way. It captures your attention and keeps you going. And yet, at the same time, you can't help but to feel a little exhausted by the similarities between how all three books choose to manage the story line, progression, and conflict--in ways so similar that I could see and feel exactly what was to come next. Anyway, much like the other two Starbound books, this one had its moments of dragging progression; although the drag came at a different point in the book, more towards the middle. 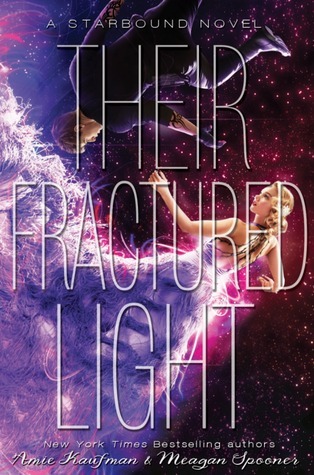 The beginning of Their Fractured Light was actually very engaging and enjoyable. I loved Sofia and Gideon at first sight... and then they chose to do things that made me groan in exasperation. But whatever, we all saw it coming anyway, right? Nothing like a pair of star-crossed lovers in a space opera to wrench those FEELS. Except I didn't so much feel the FEELS as I felt the "sighs." Then the book picks right back up again when the rest of our Starbound crew--Tarver, Lilac, Jubilee, and Flynn--come into the forefront. And then everything feels like I'm reading a whole other book rather than following the Sofia and Gideon dramatics and love story. The entire tone of the book changes; and I suppose the change was actually pretty good. We get a well-rounded conclusion--if slightly untactful, and kind of awkward, and sort of deliberate in the progressive events--and all is well in the world again. Or rather, the universe, I should say, since this is a space opera. I'm not a big fan of the whole "everything was destined to happen this way" types of story lines; and I'm really not so big a fan of a higher being in the book telling us that these destined outcomes were foreseen and so events were "nudged" in favor of those particular outcomes throughout the books. It kind of takes away from the majestic-ness of it all, and feels like the authors are doing what they need to do to roll out their intended story resolution. Or at least, that's how it feels to me. The concept of Starbound was pretty interesting, even if some of it felt a little left field, out-of-the-blue strange. Once you get into it, you kind of let it grow on you. And the characters also grow on you as well no matter how many frustratingly ignorant decisions they all make. It's an adventure of interestingly epic proportions following a band of friends with nothing to lose and everything to lose... and it's actually kind of fun. Starbound isn't the best trilogy in the world. But it is very enjoyable while you're in the moment, and it helps that, despite some of the things that bugged me about them, the characters are wonderfully crafted (even if their stories feel repetitive), and the overwrought emotions you sometimes only ever find in a young adult novel are bouncing all over the place between our six main characters, and making you feel a lot more FEELS than you'd expected to feel. Or at least, making you notice where the FEELS are supposed to be. This certainly was an interesting journey, even if not the most memorable.